Donald Jackson recalled attending a skating show in Toronto at age 8, headlined by Barbara Ann Scott. Though mesmerized by the Olympic heroine, it was Donald Tobin, a cast member, who captured his attention. “I don’t want to just learn how to skate − I want to skate like that!” Jackson recalled saying at the time. And so it was that Jackson began marking his own path in history. In 1959, he won the first of four straight national titles and claimed silver at both the 1959 and 1960 Worlds. Though he won the free skate unanimously in 1960, he could not overcome Alain Giletti’s 33-point lead after compulsory figures. “I always went out to skate my best and if I did I was always happy. The spirit is different today because money is involved. In those days, the cream was always going to rise to the top,” he said. A four-time Canadian and two-time North American champion, Jackson won the bronze medal at the 1960 Olympic Winter Games in Squaw Valley. “I was 19 years old when I won that medal. I was too young to realize how important that really was,” he said. But his legacy would be forever enshrined at the 1962 World Championships, which took place behind the Iron Curtain in Prague, Czechoslovakia. In front of 18,000 people at the Fucik Sports Hall and an estimated 250 million people watching the event live on television, Jackson needed a near-miracle to win. He got it. Skating to Bizet’s “Carmen,” Jackson made history when he landed the first triple Lutz in World competition. It was only the sixth time in his life he had landed the elusive and difficult jump. Jackson was shocked. “After all those years of training I asked myself if I could give my gold medal away,” he said. The following day, more than 25,000 people were turned away from the sold-out exhibition gala. Though Jackson did not know it at the time, his World victory would ignite a flame that inspired future generations of Canadian men. Donald McPherson, Donald Knight, Toller Cranston, Brian Pockar, Brian Orser, Kurt Browning, Elvis Stojko, Jeffrey Buttle, and Patrick Chan have all followed in Jackson’s footsteps. Jackson retired from competitive skating following the 1962 Worlds. “It is my only regret,” he said. 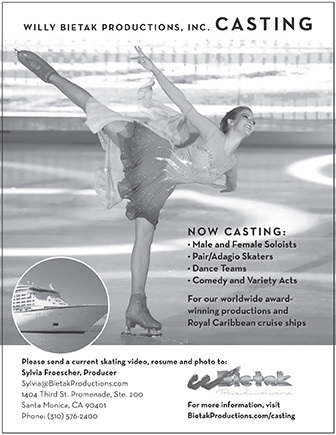 Jackson joined Ice Follies, a tour on which he skated 47 weeks a year. Over a seven year period he said he performed in 420 shows. He was inducted into the U.S. Figure Skating Hall of Fame in 1977 and was appointed to The Order of Canada in 1998. Jackson was the executive director of skating at the Minto Skating Club in Ottawa for 20 years. At age 65 Jackson was still skating professionally — and still landing double jumps. During his career, Jackson was the only skater of his era to execute a double Axel in both directions. Robert Brodie contributed to this story.